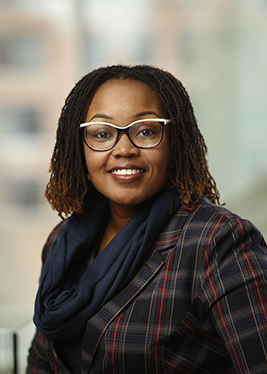 Yvette Conyers has taught in the University of Rochester School of Nursing’s Accelerated Programs for Non-Nurses and the RN to BS program as a clinical instructor/course coordinator for the past five years. She also works as a family nurse practitioner for Matrix Medical Network providing clinical assessments to members in their homes, identifying quality improvement activities, and planning individualized health care plans. In addition to her teaching role, she participates in several university-wide committees, including the Sigma Theta Tau Epsilon Xi Chapter, Council for Diversity and Inclusion, Leading with Integrity for Tomorrow (LIFT), Structural Racism Project for Agencies, and Student Bridge for Community Engagement (BRIDGES) committee. In 2017, she was awarded the School of Nursing Mary Dombeck Diversity Enhancement Faculty Award. As previous nursing director for Home Care of Rochester’s (HCR) African American Initiative she case managed 45 patients and became a certified transcultural nurse based on Dr. Madeline Leininger’s model of Culture Care Diversity and Universality. Conyers leadership in this role and community work preventing hospitalizations among older adult African Americans was recognized with a Greater Rochester 40 under 40 African American Leaders award in 2011. Conyers anticipates earning her Doctorate of Nursing Practice from St. John Fisher in May 2018. Her focus for her DNP project is assessment and evaluation of registered nurse’s cultural competence in an acute care setting.